This Thanksgiving, I’ll give thanks that the smoked turkey I tested last weekend was just that: last weekend. Not the big day. Because last weekend I lost focus and broke the No. 1 Rule of Smoking a Turkey: Start as early in the day as possible. Up until then, my timing in the pit was always good. It has to be: Whether it’s ribs, brisket or turkey, cooking a big piece of protein on steady but low heat takes dedication. That’s especially true when cooking with charcoal, which is my go-to fuel for its old-school charm and ease of control. (I used Kingsford applewood charcoal and a Weber bullet-style smoker for this recipe.) You’ve got to monitor the temperature of your smoker and maintain consistent heat, which requires running a separate grill or chimney for a steady supply of hot coals. That, in turn, requires carving out enough time to stay on top of things. The ideal temperature inside the smoker is between 250° and 275°F. At that heat, fully cooking a turkey takes about 30 to 40 minutes per pound; the bird’s ready when the meat thermometer (an instant digital version is best) reads 165°. The meat will have a pink tinge to it, but don’t worry; it’s not undercooked. That’s the smoke working its wonders. The smoking process creates a turkey that’s moist throughout and flavored with slightly sweet smoke and fresh herbs. It’s both exotic and comfortably homey at the same time, something you just can’t achieve with an oven-roasted bird. Word to the wise: Avoid smoking a bird much bigger than 16 pounds. It will start crowding the kettle and take even longer to cook than an already long (but worth it) project. Speaking of taking too long to cook… I got distracted last weekend and lost sight of the basics. A late night turned into a late morning start and, like a fool, I promised the kids I’d take them to the movies and teach them how to make pies. (I know, I know. Really dumb idea.) I let the temperature dip slightly below 250° too often and allowed too much time between fresh batches of hot coals. In the end, though, everything turned out fine. The kids were thrilled with having pie for supper and even happier when they got to eat one of the most delicious turkeys the next night. Many people take smoking to scientific levels. I’m not one of them. I first smoked a turkey out of curiosity and was really surprised with the good results. If you have any questions, chances are you’ll find the answers on Amazingribs.com, the bible of barbecuing. Meanwhile, these basics will produce a delicious Thanksgiving turkey that will have your guests asking for thirds. 1. Soak wood. Soak about eight chunks of apple or cherry wood in a small bucket of water. These fruitwoods produce a milder and some say sweeter flavor than other woods. 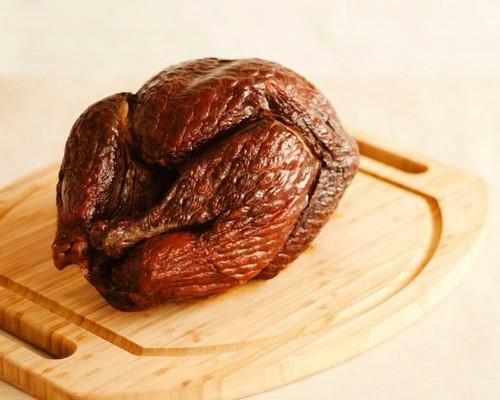 Hickory is also suitable, but some people think the flavor is too aggressive for turkey. Experiment with different wood flavors throughout the year, but you can never go wrong with apple or cherry on your first try. Add a chunk—between two to four ounces, about the size of an egg—with every third batch of fresh coals (more frequently for heavier smoke flavor). For everything you need to know about smoke wood read Meathead Goldwyn’s piece on Amazingribs.com. 2. Submerge turkey in brine. There’s plenty of debate regarding wet and dry brining (or not brining at all). Whatever method you choose, keep in mind that the ingredients will barely penetrate the meat’s surface. The skin of a turkey, however, will absorb salt and release it into the meat when cooked, helping the flesh retain moisture during the cooking process. Wet brine evenly distributes the salt and, at least to my taste, yields a juicier bird. Fill the lobster pot or bucket about halfway with water. Stir in salt. Submerge the bird and add more water if needed to cover it. Add ice to keep the water cold and store overnight in a cool place. 3. Make sure your smoker’s clean. If you don’t have a smoker, a large kettle grill will work. 1. Get up early (remember, you’ll need to smoke the bird 30 to 40 minutes for every pound). Remove the turkey from the brine and pat dry. 3. Make your rub. Herb measurements aren’t set in stone. Just don’t skimp because these herbs play really well with the smoke. A regular package of each will be enough for your bird and to season your gravy. Combine all ingredients in a mixing bowl. Slather between the breast and skin. Coat the outside of the bird. 4. Fire up the smoker. Coals are ready when the surface of each is covered with gray ash. Open the top and bottom vents of the smoker all the way. Pour one can of reduced-sodium chicken stock or two cups of water in a 9” x 9” foil pan and place it in the center of the bottom grill of the smoker or charcoal grate if using a grill. This setup helps the heat radiate evenly, while the moisture prevents evaporation from the meat. Transfer coals to grate, arranging them in a pile next to the pan. (Experts suggest putting the pan on the side of the grate. I put mine in the middle but always leave enough room for a pile of coals on the side. See next step.) Place two chunks of wood on coals. 5. Cover the smoker. Wait for the smoke to start spewing from the top vent (cold meat absorbs more smoke flavor). Insert a barbecue thermometer into the top vent. When it hits 275°, place the bird on the grill and replace the cover. I keep an extra can of chicken broth on hand and baste the bird with it three or four times during the cooking process, mainly as a way of replacing some liquid in the pan (which can be hard to refill otherwise) to maintain moisture in the smoker. 6. Control the heat. Close the bottom vents by one-third to decrease the flow of air and slow down the coal burning process. Control the temperature of the coals with the top vents. As the coals burn down, open the vents (depending the thermometer reading) to increase the temperature. As long as you replace the dying coals every hour and 15 minutes, or when the temperature starts dropping toward 225° with the top vents wide open, the bird will be cooked on time. 7. Finish the bird. After about four hours, insert a meat thermometer into the thickest part of the breast to gauge how much longer the bird needs to cook. When it hits 165°, remove and let sit at least 20 minutes. Carve, serve, and savor.